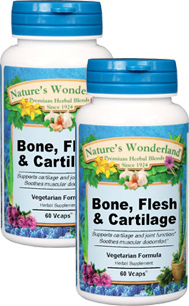 Bone, Flesh & Cartilage - 475 mg, 60 Vcaps™ each (Nature's Wonderland) - Penn Herb Co. Ltd.
Get moving again and promote healthy joints, bone, and connective tissue with this masterfully formulated herbal blend. The natural compounds in the individual herbs work effectively to ease muscle discomfort and to help maintain healthy cartilage and joint function. Black Walnut Leaf… herbal source of calcium and other supportive minerals & nutrients. Calendula…provides herbal connective tissue support and promotes healthy inflammatory response. Lobelia, Scullcap… powerful herbal antispasmodics ease muscular discomfort. Herbal support for healthy for bone, flesh and cartilage function; supports joint mobility and comfort; eases muscular discomforts; sprains; pulled muscle sprains.